The data set made use of all information available on the EU´s Community Research and Development Information Service (CORDIS) website. It was compiled and analysed manually by all SecurePART partners in an xls/csv format. Therefore our data also had the shortcomings that are visible on the website, such as incomplete partner information, missing website links and misleading information on contacts. From this data a subset containing all projects in the ESRP during the FP7 period has been derived, and the columns containing the coordinator’s names and the participant’s names were extracted. The resulting two data sets (coordinators, participants) have been processed and transformed into a tabular format once more usable in Excel. Duplicates have been removed from these two lists. Finally we ended up with a total number of 1935 participants in the ESRP during the FP7 period. For the further mapping process only the participants list was used. The overall method used for the mapping-process was a process of elimination. The first step in mapping involved a semi-automated approach. First of all, obvious companies (by filtering for “SARL”, “GmbH”, “LTD”, “NV”, “SPA”, “SAS”, “AB”, “AS”, “AG”, “BV” etc.) and Universities (by filtering for “Univers”) were removed. After this rough categorization, all left over participants were encoded by hand: based on their names and through online investigation for additional information. After mapping all 53 countries with participants in the ESRP, we have found all of the 28 EU-member states, plus 25 non-EU-member states engaged in the ESRP during FP7. A total number of 95,2% of all participants in the ESRP during the FP7 period were not CSOs. Core CSOs made up for 2%, hybrid CSOs 1,3%, and undefined CSOs made up 1,5% of all participants. 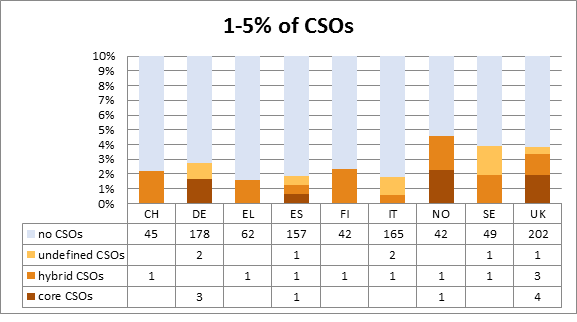 More than half (55%) of all countries engaged in the ESRP during FP7 had no CSOs at all amongst their participants. Countries from eastern- and south-eastern European regions especially often had many less or no CSOs participating. 24 of the 53 participating countries were “very small players” in the ESRP. Those countries had only 10 or less participants in total in the ESRP. We have found only one CSO participating the FP7 period within the “very small players” countries’ participants, which is far below the average CSO participation rate of 4,8%. This first insight made clear, that there are differences between the respective balance of participants in different regions and countries engaged in the ESRP; plus differences depending on the generally limited extent of ESRP participation of specific countries. The green cluster is the smallest cluster. It has the highest participation rate (10%, or more) of CSOs amongst their participants in the ESRP. Except Belgium, there are only “small players” and one “very small player” within this cluster: Bulgaria, Denmark, Luxembourg, Tunisia and Turkey. The yellow cluster, with an average of 7,9% of CSOs amongst their ESRP participants per country, has the second highest CSO participant rate. The countries in this cluster are Austria, France, Hungary, Israel and the Netherlands. The total number of participants in this cluster is 407 out of 1935. Therefore it is the second biggest cluster in terms of total participants. The orange cluster is the largest cluster in terms of participants. 898 out of 1935 participants in the ESRP during FP7 belong to the 9 countries of this cluster. These countries are: Switzerland, Germany, Greece, Spain, Finland, Italy Norway, Sweden, and the United Kingdom. This high rate of participants comes from the “big players” Germany, Spain, Italy and Great Britain, which provide together 702 of the 898 participants in this cluster. Besides these “big players”, we find the Scandinavian countries (except Denmark), Greece and Switzerland in this cluster. The average percentage of participating CSOs within the ESRP participants is, at 2,9%, lower than the overall average percentage of 4,8% of our sample. Within the red cluster are all countries with no CSO participating in FP7 Security research at all. These countries are: Bosnia and Herzegovina, Canada, Cyprus, Czech-Republic, Algeria, Estonia, Egypt, Croatia, Ireland, India, Iceland, Jordan, Japan, Lithuania, Latvia, Morocco, Moldavia, Montenegro, Macedonia, Malta, Poland, Palestine, Portugal, Romania, Serbia, Russia, Slovenia, Slovakia, Taiwan, Ukraine, United States and South Africa. From the EU 28 states, almost all states – with the exception of Ireland and Portugal – in this cluster are located in eastern- and south-eastern Europe. It is important to say that even though this cluster consists of 33 out of 53 countries, it still makes up only a small quantity of participants in FP7 Security research. Exceptions are again Poland with 62 and Portugal with 42 participants. In total this country-cluster with no CSO participation is compiled of 334 of 1935 participants in FP7 Security research. The four clusters found and explained in Chapter 1 are sorted by countries and depend on the rate of participating CSOs within all of their participants. Three countries have been selected for further analysis to illustrate the different clusters through examples. The analysis is based on country reports from the Bertelsmann Stiftung and Freedom House, as well as on the interviews conducted for the SecurePART project and the results of present database mapping. Poland had 62 participants in FP7 Security research. None of them were rated as CSOs. Public institutions compile the biggest sector of Polish participants, which differs strongly from the other country profiles below. To explain this deviation, it is important to have a look at political-historical development in the more recent history of Poland. As part of the Solidarnosc movement, the intensive fight for democratic rights from 1980 onwards led to the foundation of the democratic state of Poland in 1989. It was the first free democracy within the Eastern Bloc. Today the “[…] level of organized social and political participation remains moderate in Poland compared to Western Europe, despite the revolutionary past of the underground movement. In addition, many people feel alienated from politics, […] at least on the local level, people feel they can exert an influence on politics and that their civic engagement makes a difference.” We found our only interview-partner from Poland with the same attitude, representing the Helsinki Foundation for Human Rights (HFHR) in Warsaw, which is a CSO active in FP7, but not in the security sector. The interviewee expressed HFHR as passive in FP7, but more active at a national level. Why do we find so many CSOs inactive in Poland? During the time that Poland was applying to become an EU-member-state (1989-2004), civil rights were implemented quite well, and organized networks in non-institutionalized civil society could operate more effectively in Poland. But as the operational fields of CSOs in Poland were developing very fast within that time, only a few organizations became key partners and influential in certain issues. Trade Unions, charity organizations, sport associations and religious groups are the most popular CSOs in Poland. Research and Technology Organizations (RTOs) and State institutions for education and Research & Development (R&D) became very advanced in Poland at the same time. This can also be found in our mapping of the 62 participants in FP7-SEC from Poland, including 15 RTOs and 18 state institutions plus 18 universities. In addition, another interviewee from the UK pointed out that there is a lack of support for CSOs from government bodies in Eastern Europe, while funding from central Europe is extremely important for such CSOs. In Belgium we found the highest rate of CSOs within all of their participants in FP7 Security research. In total 20 (23,5%) of the 85 participants from Belgium were CSOs. From those 20 CSOs, most CSOs are on an international level, which indicates the high importance of the presence of the European Union and other international political bodies in Brussels. 60% of the Belgian CSOs were categorized as undefined CSOs. 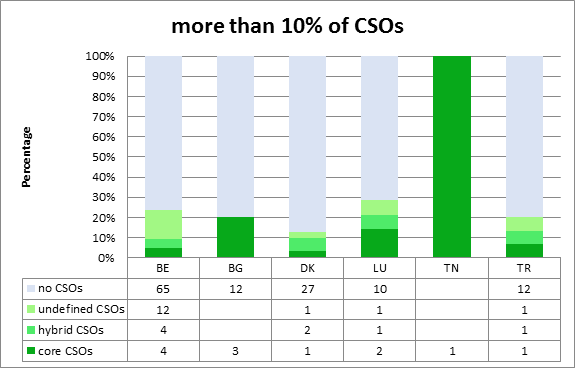 This indicates a low level of civil society representation within Belgian CSOs, because civil society representation can mostly be found within core CSOs (as core CSOs have features such as: grass roots origin, high involvement of non-professional staff, political and economic independence, common and/or public purpose, nonprofit etc.). 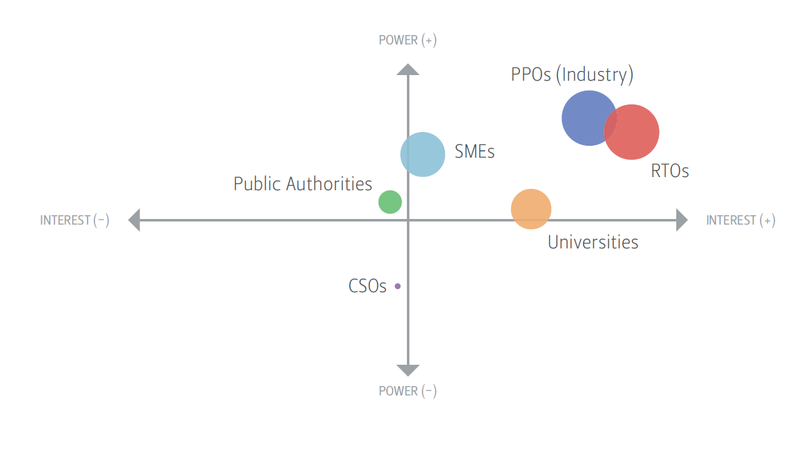 The remaining non-CSOs in Belgium draw a different picture than in the previous example of Poland: Private corporations are the larger sector in FP7 Security research participation in Belgium. Public institutions are less represented than in Poland. In our qualitative data analysis there was one interviewee from Belgium (representing a private company/stakeholder in security research), who perceived that the European Commission has done a lot to increase the involvement of CSOs in security research. But in terms of the quality of participation, the interviewee mentioned that it would most likely be better to have the CSOs as advisors than as active partners. Both statements basically point towards regular experiences with CSOs within the ESRP. The UK represents the cluster of countries with CSO participation between 1-5%; furthermore the UK also represents the “big players” in the ESRP during FP7. The participation rate of CSOs is at 3,8%, which is below the average of 4,8%. Regarding the classification of CSOs, half of the CSOs in the UK are core CSOs, which indicates a higher quality of civil society representation amongst the UKs CSOs than for instance in Belgium. Amongst the other 202 participants (95,7% of the UK’s participants) – similarly to Belgium – the biggest sector of participants is the private corporations sector, with mainly enterprises and RTOs. Universities play the biggest role within the public sector, with 48 participating universities. The dominant role of the private sector can also be found in the statement of one of the nine interviewees from the UK, who states that the representatives of CSOs should have the abilities to influence not specifically security research but the private sector as a whole. For our interviewees representing CSOs in the UK, the most common way to become involved in FP7 Security research was by invitation, either from governmental- or private spheres. Four of the nine interviewees from the UK said that this was the case. Other common reasons that hinder CSOs in the UK from participating in FP7 Security research are the difficulties of EU administration, difficulties to enter already existing lobbies as new organizations, and that certain CSOs are strongly focused on regional and/or national outreach. The ESRP shows low overall CSO participation during its FP7 period, which can be seen as a slight discrepancy from Article 11 of the Lisbon Treaty. Only 4,8% of all ESRP participants are CSOs. One can divide these 4,8% by: geographical region, quantity per country, and through a quality classification of CSOs. Geographically most of the European countries with no CSOs at all amongst their ESRP participants are in the eastern- and south-eastern European regions. Exceptions from south-eastern Europe are Bulgaria and Hungary with a rather high rate of CSOs. From Western Europe only Portugal and Ireland had no CSOs at all amongst their ESRP participants. Regarding the quantity of participants per country it became evident that amongst the “very small players” in the ESRP (those countries with only 10 or less participants in total in the ESRP during FP7) almost all of them had no CSOs within their participants. The only exception is Tunisia. The countries with a very high quantity of ESRP participants have participant rates close to the average of 4,8%. There have been differences in the classification of CSOs, too. We have classified the CSOs into core CSOs (e.g. NGOs or grass roots organizations), hybrid CSOs (e.g. stakeholder associations or umbrella organizations) and undefined CSOs (e.g. 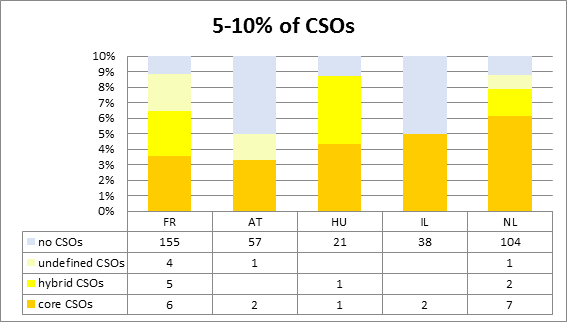 professional organizations or research focused associations).Of all ESRP participants 2% were core CSOs, 1,3% hybrid CSOs, and 1,5% undefined CSOs. This classification is very important, as it also indicates the quality of civil society representation, which is highest for core CSOs and lowest for undefined CSOs. There are also differences between the various countries regarding this classification. The biggest difference is between Belgium, with only 20% of core CSOs within their CSOs, and the Netherlands with 70% core CSOs. If the EU wants to fulfill the goals of Article 11 of the Lisbon Treaty within the ESRP, we need to formulate new rules of representation for CSOs, to actively involve them in the security research programme under Horizon 2020. Such rules should take into account that the encountered participation of CSOs in the FP7 security research programme differed between geographical regions, the quantity of total participants per country, and also in the quality of civil society representation of CSOs. This was done by copying the columns in text files and processing this text data with a PERL script. In total the raw material comprised 1935 participants from 53 countries, which all were mapped. For a closer operationalization of the multiplicity of the term CSO see D3.2 of the SecurePART project. Core CSOs: e.g. NGOs or grass roots organizations; hybrid CSOs: e.g. stakeholder associations or umbrella organizations); undefined CSOs: e.g. professional organizations or research focused associations. For a closer operationalization of the three classifications see D1.2 of the SecurePART project. For the overall analysis we summed together all CSOs types (4,8% of the ESRP participants) and simply speak of CSOs, as all of these types consist of representatives of civil society. Next to these four, there is only one more “big player” with more than 150 participants amongst our sample, which can be found in cluster 2: France, with 9% of CSOs amongst its participants. When all 53 countries with participants in FP7 Security research are included, this trend is even more visible, because Bosnia and Herzegovina, Moldavia, Montenegro, Macedonia, Serbia, Russia and the Ukraine are also within this cluster. It was important to compare the extreme examples of the green and red clusters, with ordinary examples from the yellow and orange clusters. Therefore only one country (United Kingdom) from the orange cluster was chosen as an exemplary country profile from the ordinary examples from the yellow and orange clusters. Posted in Sem categoria on 25 January, 2016 by admin. The transversal dimension elucidated here puts all stakeholders into relation with one another, and within the institutional context of the European Security Research Programme. The whole can be described as the governance regime of security research. For this reason, first, the institutional landscape for potential CSO participation in national security research programmes has to be documented and analysed. Following that, secondly, the possibilities for civil society participation opened up by the EU framework programmes will be explored. Last, based upon the selection and evaluation of existing results by EU projects, the traits and interests of major stakeholders, such as research and technology organizations (RTOs), or small and middle-sized enterprise (SMEs) will be explored. This analysis documents the enormous imbalance in participation among CSOs and other research actors in the European Security Research Programme (ESRP). To trace the dynamics of Civil Society Organizations within security research, a model of stakeholder involvement in public policy will be applied. CSOs will be positioned according to their influence capacity along the dimensions of high/low power, and of high/low interest from security research. This report is a necessary step in order to subsequently devise a course of communicative action and activities to integrate and empower CSO participation in security policy making. Posted in Sem categoria on 12 January, 2016 by admin.